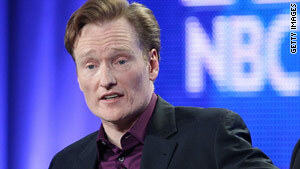 Conan O'Brien will host "The Tonight Show" for the last time Friday after seven months at the show's helm. The flame-haired comedian has signed a deal with NBC to walk away from "The Tonight Show." The Wall Street Journal reported that the pact -- some $45 million for O'Brien and his staff -- contains a "non-disparagement clause" for both O'Brien and the network, which means they can't say nasty things about each other in public. O'Brien has been at odds with NBC since the network tried to push "The Tonight Show" to a later time slot. The dispute erupted into a weeks-long controversy that galvanized fans of the show and roiled the entertainment industry. The deal reinstates Jay Leno as host of "The Tonight Show" at 11:35 p.m.
O'Brien, who has hosted the show for just seven months, objected to the change. He said in a January 12 letter addressed to "People of Earth" that moving the show back would "seriously damage what I consider to be the greatest franchise in the history of broadcasting." According to biography.com, O'Brien attended Harvard University, where he was president of The Harvard Lampoon humor magazine. He wrote for HBO's "Not Necessarily the News," NBC's "Saturday Night Live," and Fox's "The Simpsons." O'Brien will make his final appearance tonight as host of "The Tonight Show" and will be free to "pursue other opportunities" as soon as September 1, the parties said in a joint statement. Triumph, the Insult Dog, stays with NBC. Sit, Triumph! Good dog. The Brinkses are adopting two Haitian children, 3-year-old Manuel and 6-year-old Samra, from the God's Littlest Angels orphanage in Port-au-Prince. The couple from Holland, Michigan, appeared on CNN on Saturday night with Wolf Blitzer, who showed the Brinkses on one side of the screen from a Grand Rapids studio and on the other side, their adopted children and orphanage workers in Haiti. During the interview, the orphanage's director, Dixie Bickel, said she was concerned that water and cooking fuel were running short. Mlive.com reported that the Brinkses, who also have a young son and daughter, went on a mission trip in 2008 and then decided to adopt Manuel and Samra, whom they returned to visit two more times. The State Department said Monday it was working with the Department of Homeland Security and the Haitian government to process nearly 300 cases of Americans who are waiting to adopt Haitian children. Of those, 200 cases are being accelerated. Before the earthquake, UNICEF officials estimated that Haiti already had 380,000 orphans. The star of the show did not appear -- and the film in question was not shown -- but Hillary Clinton's big-screen moment was all the talk at the Supreme Court last March. The justices heard arguments in a free-speech case over a 2008 documentary, shown in theaters, that was sharply critical of the onetime presidential candidate and current secretary of state. At issue was whether the 90-minute "Hillary: The Movie" and television ads to promote it should have been subject to strict campaign finance laws on political advocacy or should have been seen as a constitutionally protected form of commercial speech. Citizens United, the conservative group behind the movie, wanted to promote it during the heat of the presidential primary season, but a federal court blocked any ads, as well as airings on cable TV video-on-demand. The Washington-based nonprofit corporation and advocacy organization had balked at campaign finance rules that would have required it to disclose its financial backers and would have restricted when the film could air. The film was partially financed with corporate funds. The comprehensive 2002 McCain-Feingold law banned broadcast of "electioneering communication" by corporations, unions and advocacy groups if it would be aired close to election dates and would identify candidates by name or image. On Thursday, the Supreme Court gave big business, unions and nonprofits more power to spend freely in federal elections, a major turnaround that threatens a century of government efforts to regulate the power of corporations to bankroll American politics. A 5-4 conservative majority crafted a narrow overhaul of federal campaign spending that could have an immediate effect on this year's congressional midterm elections. Who made the movie at the heart of the case? David Bossie, head of Citizens United and producer of the "Hillary" film, told The Washington Post that his group spent about $1.25 million in legal fees on the case. "We have been trying to defend our First Amendment rights for many, many years," Bossie said. "We brought the case hoping that this would happen ... to defeat McCain-Feingold." Bossie was also behind several conservative documentaries, including a rebuttal to Michael Moore's anti-Bush film "Fahrenheit 9/11." California's parole board has denied parole for Broderick, once a socially prominent lawyer's wife, who in 1989 fatally shot her ex and his new wife in bed. Broderick's date Thursday with the parole board marked the first time she was eligible for release for the murders of Harvard-educated San Diego, California, attorney Daniel T. Broderick, 44, and his wife of seven months, Linda Kolkena Broderick, 28. When Betty Broderick's husband of 16 years dumped her for his young legal assistant, she was enraged, and she is still angry, the parole board concluded Thursday after hearing Broderick's rambling statement. "She was totally not remorseful, didn't even try," said San Diego Deputy District Attorney Richard Sachs. Broderick won't be eligible for another parole hearing for 15 years -- the maximum time the law allows, Sachs added. After Broderick's husband left her for his legal assistant, she covered the interior walls of his house with black spray-paint and drove her car through his front door. She left obscenity-laced tirades on his answering machine. Then she crept into his bedroom early on a Sunday morning and shot him and the other woman, by then his wife, to death. When she was arrested and tried in the early 1990s, Broderick said she was the victim, telling a tale that resonated with many wives who feared being replaced by younger women. Court-watchers broke into two camps, known as Betty-boosters and Betty-bashers. Now 62, Betty Broderick has been in prison longer than she was Mrs. Daniel Broderick. Her failed bid for parole brought back strong emotions over a case that spawned several books and two made-for-TV movies starring Meredith Baxter. Nearly midway through production of "The Imaginarium of Doctor Parnassus," Ledger, one of the film's stars, died, leaving director Terry Gilliam shattered over the loss of his friend and ready to give up on the movie. Gilliam then called on Ledger's buddies -- Johnny Depp, Colin Farrell and Jude Law -- to complete the film by playing versions of Ledger's role. Gilliam told CNN, "I was attracted to his talent. Talent is a special thing, and when somebody has got so much, you're just fascinated. How does he do it? He just could do it. He did it effortlessly. He was a guy who was improving his craft as an actor. Great fun, and everybody recognized an old soul there. He had an experience way beyond his years. It was impossible. My joke is 'He didn't die young at all, he was a couple hundred years old when he died.' "
Ledger won a posthumous Academy Award for his portrayal of The Joker in "The Dark Knight." New York City's Medical Examiner attributed his death to an accidental overdose of prescription drugs. Ledger died on January 22, 2008. He was 28.